Cox Powertrain is planning to bring a new and unique diesel outboard concept to market in 2018. 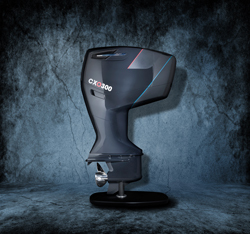 Originally developed for the Formula 1 (F1) circuit by motor sports engineer (and company co-founder) David Cox, the technology that forms the core of the CXO300 outboard has certainly been around the track in terms of development and interest. Although the engine never made it into F1, Lockheed Martin picked up on the technology, with a view to incorporating it into unmanned aerial vehicle (UAV) design. This offer was to lure Cox and his investors to the marine sector, and sparked interest from the UK Ministry of Defence (MoD). The MoD’s Defence Science and Technology Laboratory (DSTL) was so impressed by the concept, it provided Cox Powertrain with “invaluable technical assistance” in further developing the CXO300 for marine use, as well as £2.5 million (US$3.18 million) of funding. Since then, the CXO300 has attracted £60 million worth of investment by launch, enabling Cox Powertrain to set up its own assembly facility in the UK and to grow its team to 65 people. Reid describes the CXO300 as being “more like a diesel stern drive than a petrol engine” – and with a longer lifespan to boot. Weighing 300kg and measuring 1.9m (h) x 997mm (l) x 672mm (w), the 3.7litre outboard has been manufactured to the specifications of the company’s Opposed Piston Diesel (OPD) concept, featuring a vertical crank and four cylinders with two pistons on each side. The engine can generate 261kW at the crank, evening out at approximately 224kW (or 300hp, hence the outboard’s name) at the propeller – though, Reid hints, a propeller rating of 320hp / 239kW could be possible. The CXO300’s maximum torque is rated 550Nm at 4,500rpm. The swap to diesel could result in “20-25% less fuel consumption”, Reid says. He adds: “The CXO300 achieves one unit of hp per every 1kg of weight. In contrast, the average V6 engine achieves a single unit of hp for every 2kg of weight.” Cox Powertrain estimates that the CXO300 should be fit to undergo 1,200 hours of continual use yearly before requiring maintenance. Foreshadowing the product’s 2018 commercial launch, Reid says: “In 2017, we’ll be producing 43 field evaluation units, which will go into the field for Gamma testing.” The group also plans to establish itself in a further 30 locations before 2017 is out.